Schaeffler Technology Center have defined a specific range of best-in-class expertise in rolling bearings and related areas – proof that Schaeffler is living up to its obligations as a premium supplier by providing the best possible support to customers with the same high quality standards throughout the world. Regular training courses, workshops and audits ensure that this standard is permanently upheld. Whether in Europe, Asia, Africa, North or South America - our customers always benefit from over 100 years of rolling bearing experience. Knowledge about the machine or unit and its function in the process that makes it is possible to derive the product features and services, which fulfill customer expectations. Calculation of products in their adjacent construction taking internal and external influences into consideration with the Schaeffler Group’s calculation tools, such as BEARINX®, Caba, FEM etc., in order to precisely analyze the use of the product and optimize it or ascertain its suitability for the application. Production process knowledge = knowledge about production processes and their interactions with machines, facilities or units that makes it is possible to derive the product features and services, which fulfill customer expectations and support the process. Products and services for condition monitoring of machines and facilities, e.g. vibration measurement, thermography, fluid management to support the maintenance process. The interaction of mechanical, electronic and IT components and modules for all aspects of rolling and plain bearings, electric motors, accessories and linear guidance systems. Failure analysis = analysis and assessment of the cause of the failure in rolling and plain bearings, accessories and linear guidance systems. 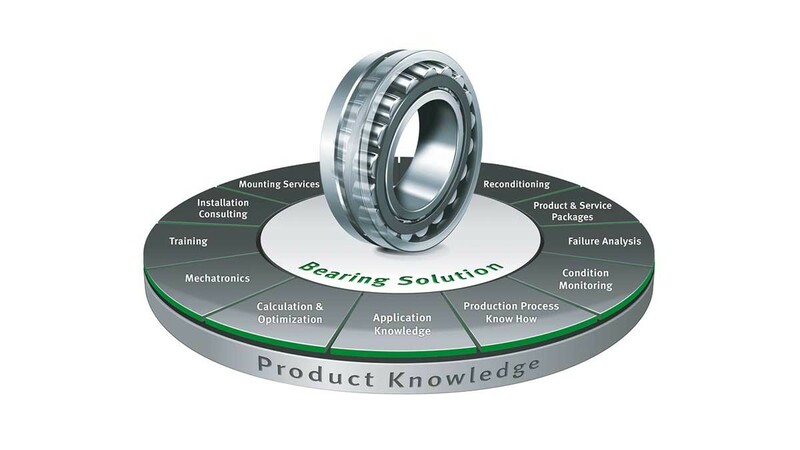 Standardized or individual training on the topics products, principles of rolling bearings, mounting, condition monitoring, failure analysis etc. for customers, sales partners and employees of Schaeffler. Unit-specific packaging of products for machines and facilities to support the supply chain and maintenance processes of the customer. Consultations about how the product is installed, which products or accessories are required and how the assembly process is carried out. Carrying out and monitoring the mounting and dismantling of rolling and plain bearings, accessories and linear guidance systems. Thanks to the collaborative efforts between the experts and the local engineers in the Schaeffler Technology Center, you receive innovative, premium solutions that are tailored to your specific needs - and always state-of-the-art. Working with an experienced partner also allows you to focus your undivided attention on your core business. In addition, our global network allows for extremely short response times, coupled with the added benefit of Schaeffler sales engineers who are trained to proactively develop suggestions for improvements. In this way, Schaeffler provides comprehensive support to machine manufacturers and operators. We are firmly committed to your company’s success on all levels - technical as well as commercial. With our Global Technology Network, Schaeffler is therefore able to achieve lasting reductions in the overall costs of machines and systems while increasing our customers’ competitiveness through efficient solutions.